With his wife dead and buried, and life nearly over at 75, John Perry takes the only logical course of action left: he joins the army. Now better known as the Colonial Defense Force (CDF), Perry’s service-of-choice has extended its reach into interstellar space to pave the way for human colonization of other planets while fending off marauding aliens. The CDF has a trick up its sleeve that makes enlistment especially enticing for seniors: the promise of restoring their youth. After bonding with a group of fellow recruits who dub their clique the Old Farts, Perry finds himself in a new body crafted from his original DNA and upgraded for battle, including a brain-implanted computer. But all too quickly the Old Farts are separated, and Perry must fight for his life on various alien-infested battlegrounds. Wow…..just, WOW. I am not much of a science fiction reader, not because I do not like it, but because my TBR pile (affectionately know as Mt. Readmore) is full of fantasy books. But this book, this book rocked my socks off. I would call this “hard” science fiction, “hard” in the sense that there is lots of science and technology, no “mystical force” or “hokey religions” (to quote Han Solo), there are very techie explanations for every thing that occurs. The story, the characters, the plot, I loved them all. I will definitely to adding this series to my reading list. And the title, very, very appropriate. Well done, Mr. Scalzi, well done indeed. Posted in Book Review, Science-Fiction. Tagged book review. 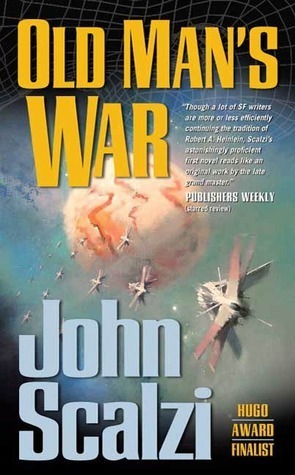 I’ve only read one novel by Scalzi, Lock In, but I liked it a lot. I do want to read more of his works, and when I do get back to him, the Old Man’s War series is what I had been intending to read. I have heard great thing about Lock In. I am hoping to read it soon.